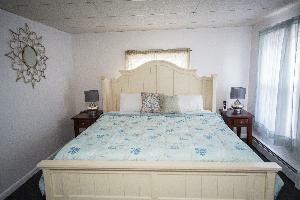 All rooms are standard with TV, cable television and free wifi. All rooms are not handicapped accessible- guests must be able to climb some sort of steps/stairs. Please also note that there is limited cell phone reception coverage, so Queens Mountain Lodging provides a landline telephone in each room. 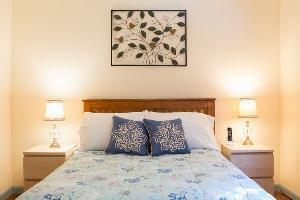 Rooms should be booked based on 1 or 2 people, as there is only 1 bed per room. Cots can be provided at an additional $20.00 (for children). Free Wi-Fi, DirecTV, landline phone available for your convenience. Beautifully decorated rooms, gardens, pieces of art. 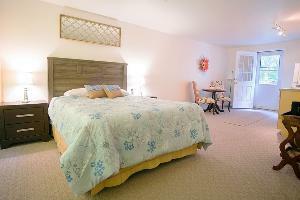 Conveniently located in the heart of the town with quick access to shopping, food and vacation activities. The Inn Collects payment in full for the Room(s) reservations at the time of booking on the WebReserv site. In order to confirm the Reservation, you will be asked to submit your Credit Card and it will be processed online. The Cancellation policy is as follows: If you are making a reservation for the near-term, a one week in advance cancellation is required and we will refund your money in full should this occur. For a longer term reservation, a one month in advance cancellation is required to receive your money in full. Normal Check in time is between 3pm and 7pm. 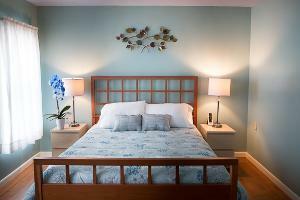 We will make every effort to have your room prepared earlier and if ready will gladly let you in. Check out time is 11am. We require a 2 night minimum on Weekends, Holidays and on weekdays during the Premium Season (May-October). Exceptions can be made if a room is available. Prior arrangements must be made for pets and pre-approved otherwise guests will be subject to a fine. Cell phone: 917-304-8053 and we will make arrangements to get you a key to get into your room. Additionally, due to the limited cell phone coverage, we provide landline phones for outgoing calls only. High speed wireless internet access is also provided for your convenience. Please be sure to provide an email address in order to be included on updates for your reservation details. We look forward to your stay at Queens Mountain Lodging.